Mary adored her Dachshund Daisy and always wanted her by her side. One 85°F day, while the “girls” were out for a car ride, Mary made a quick stop at the convenience store for a jug of milk. In the store, she encountered a new cashier who was having difficulty working the cash register. The line of impatient customers grew and Mary was delayed returning to the car and her precious Doxie. Ten minutes passed and although the windows were cracked open, the temperature inside climbed to 125 degrees! Daisy was in distress…she was panting profusely, her gums were bright red, her heart was racing, there was foam around her mouth — Daisy was suffering from Heatstroke. Even with windows open, a parked car can quickly reach more than 150 degrees resulting in heat stroke, permanent brain damage or death to your pet. Never leave your dog or cat unattended in the car for even a few minutes. Pets don’t sweat to regulate their body temperature (100.4̊ F – 102.5̊̊F). They pant to exchange cooler outside air with the warm humid air in their lungs while cats don’t usually pant until they are overwhelmed by the heat. If the outside air isn’t cooler than their body temperature, an animal can succumb to Heatstroke which can cause brain damage, kidney failure, cardiac arrest and death. 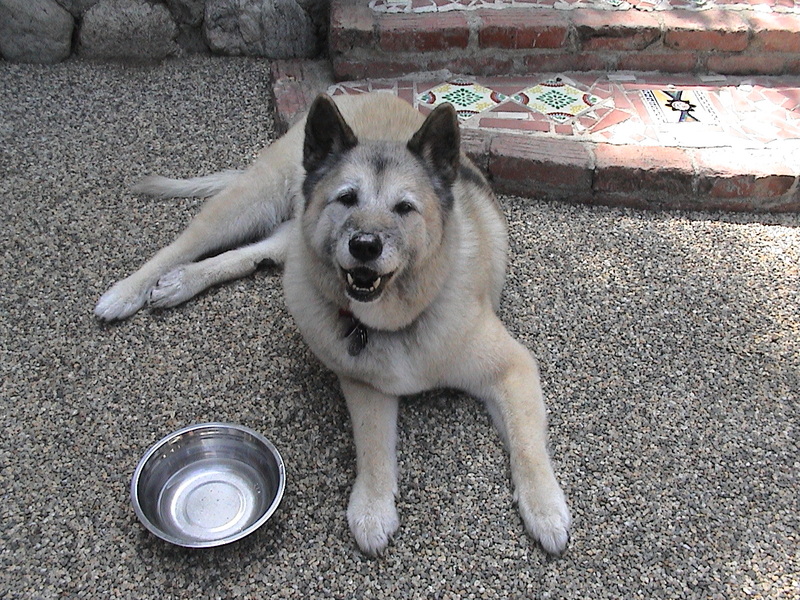 Old and overweight pets as well as short-nosed breeds are at the greatest risk. An air-conditioned house is safest for your pet, but the next best thing is a well-ventilated/insulated doghouse or a shaded porch with a fan or misting system. Provide fresh water all day long making sure that outside bowls remain in the shade even when the sun moves in the late afternoon. Outside food bowls should be placed in a pan containing a few inches of water to keep ants out. Also remember… Hot concrete & asphalt can burn precious paws! Walk your pets during the cool parts of the day and stick to the grass. If it’s too hot for your bare feet, it’s too hot for paws. Dog shoes are great on hot surfaces for short periods of time, but since heat is expelled from the pads of the feet, you dog is likely to overheat if his paws are covered for long periods on hot days. Walk dogs during the cooler parts of the day and stick to shady areas and grass. Even beach sand can burn paws and make a canine body too hot! Always make sure pets have a supply of cool fresh water. If that outdoor water bowl has become a bird bath, is empty or is sitting in the blazing sun, it is not a good source of hydration for Fido! Make sure dogs in fenced yards always have shade to retreat to. Notice the situation at different times of the day and year to make sure the shade cast by your lovely backyard tree isn’t only on the other side of the fence in the neighbor’s yard leaving your dog in the hot sun. NEVER leave a dog in a parked car for even a moment. If he can’t get out with you at every stop, he is better off home in a temperate environment. Get to know your groomer! Blow drying animals in a well-ventilated area is important to their health, and cage dryers (big boxes containing your pet into which air is forced to dry them) must be carefully monitored, so choose a groomer you know has your pet’s best interest at heart. Pay particular attention to senior, over-weight and brachycephalic (flat faced) pets who have more difficulty breathing even at comfortable temperatures. Signs & Symptoms include: Temperature greater than 102° F, heavy panting, gasping, vomiting (if not yet dehydrated), foam around the mouth, weak or high pulse, inability to drink, bright red or suddenly bluish gums and loss of consciousness. Move pet to a cooler environment. Indoors is best with a cool fan blowing on your pet but even a shady sidewalk or grassy area can help. Wet the animal with room temperature water (not ice as it restricts blood flow). Think “From the paws up!” getting the skin on the paws, pits, groin and belly skin cooled is most effective in quickly cooling your pet. 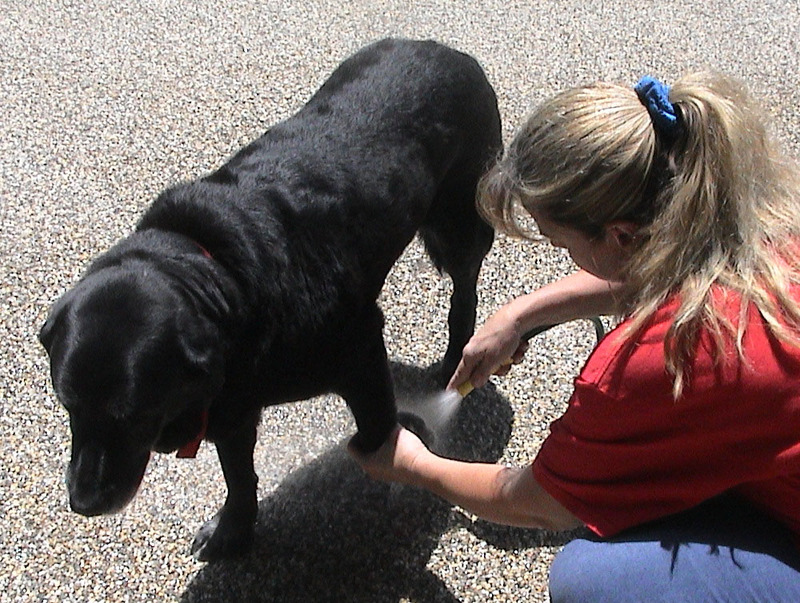 Water often skids off fur on breeds with undercoats and does not cool skin when applied to their back. If you place your dog or cat into a tub or pool, do not let the water rise higher than the belly. Immersing him to the neck will cause him to cool too quickly resulting in hyperthermia. Rubbing alcohol or witch hazel wiped onto the inner flaps of the ears and pads of the feet has an amazing cooling effect. Do not however douse an animal with an entire bottle of rubbing alcohol. This could cause a sudden change in body temperature and result in Shock. Placing a cool pack (or bag of frozen peas) on dog or cat’s neck and groin can prove helpful in cooling him off as the cooled blood flowing through those arteries cools the rest of the body. Remove pack every few minutes to make sure you don’t cause frostbite to animal’s tissue. Never force pet to drink as he could aspirate fluid into his lungs. Dribble a little water from an eye dropper or spray bottle to keep him hydrated. At the Veterinarian’s office, fluids will likely be administered subcutaneously (under the skin or intravenously). Check your pet’s temperature and if it is 104°F or higher, get to the Veterinarian immediately! Wrap animal in wet sheet or towel, turn on car air conditioning and drive quickly but safely. If pet goes unconscious, rub a little honey or Karo Syrup® on his gums to increase blood sugar level, and be prepared to administer CPCR. If the pet cools too quickly and temperature drops to 100°F, cover him with a blanket and place a 2-liter bottle filled with warm (not hot) water next to him as you transport him to the Animal ER. Fortunately for Daisy, Mary was trained in Pet First-Aid & CPCR and knew what to do to save the life of her precious Dachshund. She learned her lesson though and never again took Daisy for a car ride if she’d have to be left alone for even a very short time. In addition to knowing what to do, you must learn the location of your nearest Animal ER and have an up-to-date Pet First-Aid Kit for your pooch or kitty. Perform a Head-to-Tail check-up weekly feeling for lumps and bumps, noticing the condition of skin and coat and making sure no unusual odors or discharges are coming from any body part. By getting to know what is normal for your individual dog or cat, you will more quickly notice something ‘not quite right’ and get the help he may desperately need.